The scenario we are addressing is a user who forgot their password. Remember that as part of the Sign In page, we have a link to handle such. When the username entered corresponds to a real user on the site, we send a message, to the email address on record for that user, with a link which will allow her to reset her password. For security reasons, this link can only be used once. The View class produces the form. The shortcode “ferl_request_password_reset_form” is added in line 4. 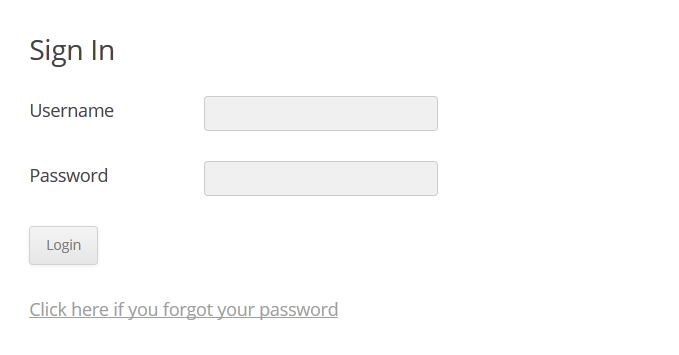 If a logged-in user accidentally arrives here, show the logout form, else show the form defined below. This is a standard HTML form, a variation on what was done before. The Controller looks for the “ferl_action”, and calls the appropriate method in the Model. The Model serves two functions initially. To validate the username, and send the email. Validating the username is straightforward, see lines 8-20. Note that we use the global wpdb (database) object. One of the fields in the WordPress users table is the user_activation_key field. We will use that field to store a key which is generated using the wp_generate_password function (see lines 27-28). The rest of the function then uses the wp_mail function to send an email, and to redirect to an “Email Has Been Sent” page. The clickable link is set in line 36. It contains “action”, “username” and the “key” as GET parameters. When this link is clicked from the email, or copy / pasted into the browser address bar, a GET request is generated. The request is for the “reset-password” page which we will create. On that page, there is a shortcode “ferl_reset_password_form”. The reaction to the GET request, is in two parts. First the controller will intercept it, and validate the request. If something is wrong, we stop all processing and present an error message. If it passes, WordPress will continue loading the reset-password page and the View class will handle the shortcode. Lines 5-6 are added to the Controller’s init() method. We hook this to the “template_redirect” action hook which is triggered just before a page is rendered. // logged in ? I don't think so !! Lines 10-11 define the “death message”. It is used in lines 27, 28, 31, 37. The “key” is killed / reset in lines 16-17 and 40-41. Only when everything checks out, does the method return, and the “reset-password” page continues to load. Note how the ferl_reset_password_form shortcode is added in line 5. The reset_password_form method is similar to the password_form method introduced on page 1 of this article. Whereas the latter could only render a form when a user is logged in, this one will only render when nobody is logged in. Also note that both methods call the same form to be rendered, i.e. password_form_view (see line 13). And that is it. User registration is next.